These 7-day programmable thermostats are Wi-Fi enabled, compatible with almost all HVAC systems, and can be controlled from your smartphone or tablet. Location-based temperature control — Runs your AC based on your smartphone's location. 200 miles away? The Lyric knows your home doesn't need as much cooling. Right around the corner? The Lyric senses your return and helps make you comfortable upon arrival. 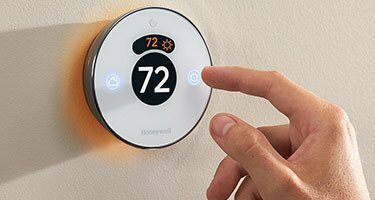 Intelligent comfort control — Considers both humidity and temperature to maintain your comfort, so 72° always feels like 72°. Indoor air quality control — Control an indoor air quality accessory, like a whole-home dehumidifier. Humidity readout — View and adjust humidity levels in your home. On-thermostat weather — See outdoor weather at a glance. Smart notifications — Sends you notifications when the humidity changes and if the temperature is too high or too low. Motion-sense illumination — Lights up when you approach, so you can easily see the screen in the middle of the night. 4.3” color touchscreen — Easy to use and see, even in the middle of the night. Temperature scheduling — Create cooling schedules so that your AC does not run when anyone is home, allowing you to save money. Indoor relative humidity display — See how humid your home is (or isn't). Energy efficiency manager — Monitor indoor and outdoor temperatures and system use over time to better manage energy and comfort. Dealer display — If your air conditioner needs repair or routine maintenance, the thermostat’s display will show your dealer’s contact information for greater convenience. Air filter alerts — Reminds you when filters need to be changed. Live weather display — Displays live weather data, including 5-day forecasts, radar images and weather alerts.